Lower Permian: fig. 1, 10 - Sakmarian; fig. 2-9, 11-13 - Artinskian. Fig. 1-8, 10-13 - Kazakhstan, Pri-Caspian Dipression: fig. 1-8, 10 - North Dipression Side Zone, Karachaganak Massif, borehole 13: fig. 1, 10 - sample 684 (depth 5178.2-5185.4 m); fig. 2-8 - sample 3061 (depth 4995-5001 m); fig. 11-13 - East Dipression Side Zone, Aransay Massif, borehole P-2 (depth 4533-4560 m); fig. 9 - Bashkartostan, west slope of the mountain Sarabil', (Nazarov, 1988). Fig. 1-5. Copicyntra acilaxa Nazarov: 1 - FF-P229/201-00336 (bar=115µm); 2 - FF-P229/201-00337 (=115µm); 3 - FF-P229/201-00331 (=50µm); 4 - FF-P229/201-00306 (=115µm); 5 - FF-P229/201-00305 (=115µm). Fig. 6, 7. 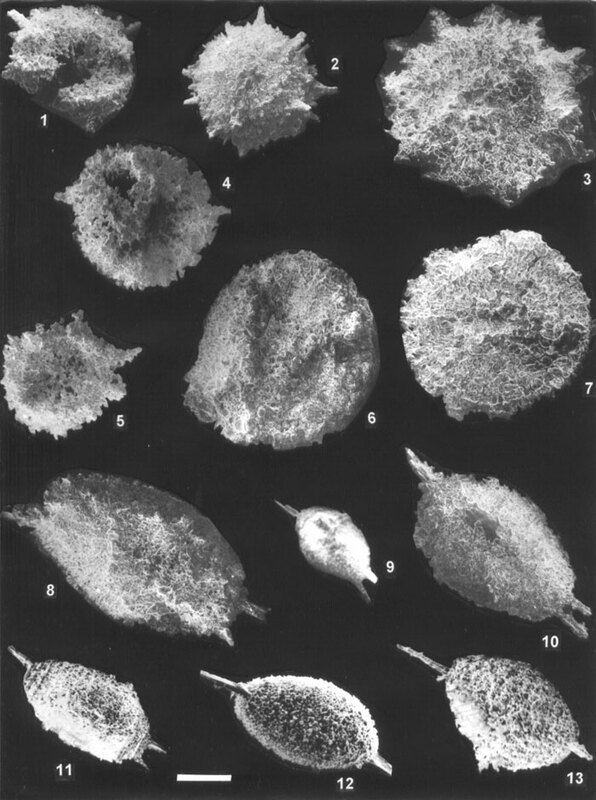 Rectotormentum fornicatum Nazarov et Ormiston (=50µm): 6 - FF-P229/227-00323; 7 - FF-P229/227-00330. Fig. 8-11. Copiellintra bispina Nazarov et Afanasieva, sp. nov.: 8 - FF-P229/214-00329 (=50µm); 9 - GIN-4673/147 (=100µm); 10 - holotype, FF-P229/214-00324 (=50µm); 11 - FF-P229/214-05507 (=60µm). Fig. 12, 13. Copiellintra diploacantha Nazarov et Ormiston: 12 - FF-P229/215-05207 (=60µm); 13 - FF-P229/215-05508 (=60µm).